A ground-breaker in many ways, Lorrain Mintzmyer served as the first woman in a variety of senior NPS positions and inspired a generation of NPS employees. Lorraine Mintzmyer’s contributions during her decades-long career with the NPS were profound. She served as the agency’s first female programming officer for a regional office, first female superintendent of a major NPS area, first female deputy regional director, and first female regional director. Born in Adair, Iowa, she studied business administration at Iowa State Teachers College and the University of Nebraska. 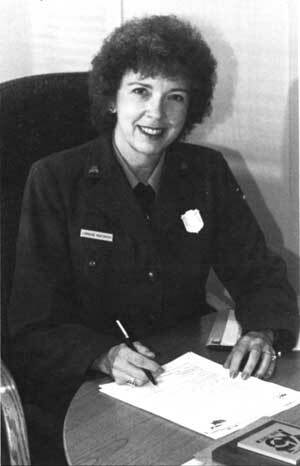 She joined the NPS in 1959 as a secretary in the Midwest Regional Office and took on a number of other positions before becoming superintendent of Herbert Hoover National Historic Site in 1973. Two years later she entered a departmental manager development program in Washington, D.C., and after completion was assigned as superintendent of Buffalo National River. She became deputy regional director of Southwest Region in Santa Fe in 1978 and director of that region a year later. In 1980 Mintzmyer became regional director of Rocky Mountain Region in Denver. She vigorously supported NPS policies on managing predators, such as bears and wolves, in the western parks and co-chaired the Greater Yellowstone coordinating committee, which was created to provide uniform policies among federal and state agencies on managing the Yellowstone ecosystems and played a key role in developing the interagency fire management coordination within the Rocky Mountain Region after the 1988 Yellowstone fires. She became regional director for the Mid-Atlantic Region in Philadelphia in 1991 and retired from the park service in 1992. In recognition of her unique and substantial achievements and contributions, Mintzmyer received numerous awards to include the Department of the Interior’s Meritorious Service Award and its Distinguished Service Award. She inspired a generation of NPS employees, particularly women and minorities, with her strong work ethic, commitment to the agency, quality leadership, and management skills.